You may have heard of Head-Up CPR as a new approach to patient positioning during CPR. It may not be totally prime-time yet(although it is being used right now), but it is, thinking outside the box and concentrating on the most important part of what cardiac resuscitation is about…. saving the brain. If we go right back to asking “What are we trying to achieve in resuscitating patients?” The real answer is neurologically intact survivors. This is exactly what head-up CPR is about. The initial question came from at the unexpected problem of how to transport cardiac arrest patients in South Korea, where the accommodation is high-rise buildings and the lifts are very, very small. Patients were transported with either head up or head down, purely to fit into the lifts. The question regarding which position was better had to be answered. The initial 2014 study used a porcine model with automated CPR and an impedance threshold device. CPR was performed for 5 minutes in the supine position and then a 30 degree head tilt up and then head-tilt down was performed. Cerebral blood flow(CBF) and cerebral perfusion pressure(CPP) were found to be higher in the head-up group. This was primarily thought to be due to gravity-dependant venous drainage from the brain, cerebral venous sinuses and the paravertebral venous plexus. Blood flow in the lungs was also thought to be redistributed, in a similar mechanism to that which results in cardiac failure patients performing better when sitting up. Studies using a cadaver model, found similar changes in intracranial pressure(ICP) and CPP. A higher CPP, however doesn’t always lead to improved oxygen and nutrient delivery to the brain as per the pressure vs flow argument. Even though we need more research before we have a greater take-up of this CPR method, it has already moved from the laboratory to the real world with EMS services in Palm Beach County, USA, using it and reporting a doubling of survival rates. Circulatory adjuncts are required for CPR. 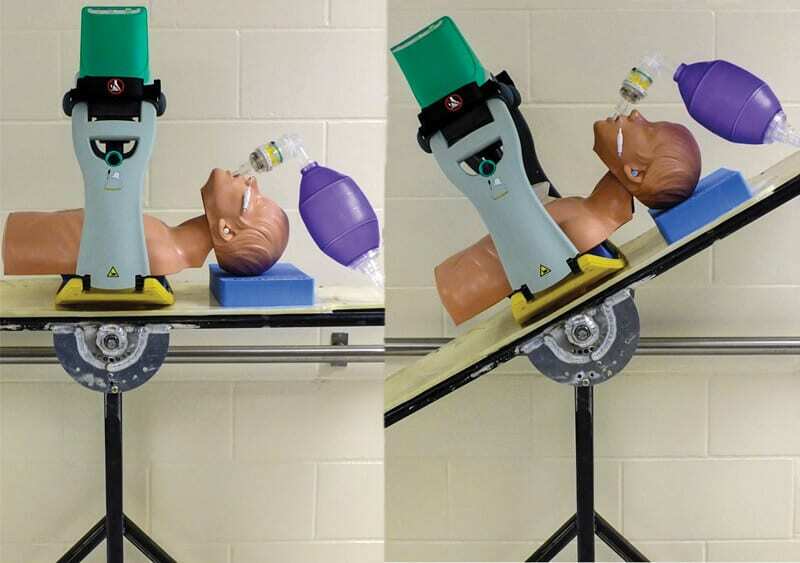 Mechanical CPR devices have been used in two studies with differing results of CPP. One study demonstrated CPP at 7% of baseline values which is considered incompatible with life. Rapid elevation of the head may result in a significant, gravity related, drop in aortic pressure. The optimal head-up position hasn’t been agreed upon, however 30 degrees appears to be the adopted angle. Head-up rather than whole body up position should be used, to avoid venous blood pooling in the lower extremities over time. The location of the heart in the sitting position, may differ to that of when the patient is supine. In one study it was reported that the heart was up to 4cm superior and 4cm to the left of where expected. This may affect the positioning of manual or mechanical CPR. This may be the next big thing. Watch this space. Moore JC et al. Head and thorax elevation during active compression decompression cardiopulmonary resuscitation with an impedance threshold device improves cerebral perfusion in a swine model of prolonged cardiac arrest. Resuscitations. 2017;121:195-200. Moore JC et al. Head-up position lowers intracranial pressure in a human cadaver model of cardiopulmonary resuscitation. AHA resuscitation Science Symposium and Scientific session. New Orleans 2016. Years ago in ICU, before abandoning CPR on a few patients with arterial lines, I tried leg elevation followed by abdominal pressure. My hypothesis was to first help reverse the venous pooling in the legs and give some preload when there was no -ve intrathoracic pressure, then to brace the diaphragm so we weren’t trying to change the pressure by pushing on one side of an open (floppy diaphragm) box. I had read about how effective it was in dogs, and it did appear to increase SBP by 20-30mmHg. The downside is the distraction from basics and extra people needed. Maybe feet up, tummy tuck and head up is the way to go when we have a cast of thousands!